Why do we think SMILE eye surgery is a great procedure? Five years ago we became the first laser clinic in New Zealand and the second in Australasia to perform SMILE surgery for correcting short sight, and it is now the type of laser eye surgery we perform most often. We have found it to be an amazing procedure with excellent outcomes and safety. Since we started doing SMILE surgery five other laser clinics in New Zealand have followed our lead and bought a Visumax femtosecond laser which is needed to perform SMILE surgery. There are now (May 2018) only two laser clinics in New Zealand not performing SMILE surgery. The Visumax laser costs almost twice as much as other femtosecond lasers but most NZ laser surgeons have seen that the advantages of SMILE makes the extra costs worthwhile. Most people, medically trained or not, are able to see the benefits of SMILE compared to LASIK and we are finding these days that almost all our short-sighted patients come to see us having already decided that they want SMILE surgery. Unfortunately, there are still a number of untruths and outdated statements put out on the internet which may dissuade people from considering SMILE surgery for correction of their short sight. This article is to share some insight into what we know about SMILE surgery and to correct some of these false statements. SMILE has been carried out in clinical trials and at laser surgery clinics worldwide since 2007. The procedure has received FDA (USA) and CE (Europe) approval and is performed all over the world. Over a million cases of SMILE have been performed in clinics like the Wellington Eye Centre worldwide with excellent outcomes. SMILE surgery uses a femtosecond laser to correct vision. Femtosecond lasers have been used to perform LASIK eye surgery since 2001 when the IntraLase laser was first introduced. There is no fundamental difference between a Visumax laser and an Intralase except that the Visumax is faster and more accurate and precise than the IntraLase, which is unable to perform SMILE surgery. If long-term complications were going to occur with SMILE, then they would also occur after LASIK which uses the same type of femtosecond laser to cut the corneal flap. LASIK has been performed using a femtosecond laser since 2001 and no long-term complications are appearing at this time. The laser part takes 30 seconds and it takes another 60 to 90 seconds to complete the whole procedure. Because LASIK involves the use of two lasers, the patient has to be moved between the two lasers and both lasers need to be calibrated, so a LASIK procedure takes longer to perform than SMILE. It actually heals more quickly. The only incision on the cornea with SMILE is 2.3mm long and heals completely within 24 hours. This means you can return to all normal activities, including swimming and wearing makeup after only 3 days. The corneal incision with LASIK is much longer and takes longer to heal, meaning that there are activity restrictions for 3 -4 weeks after the procedure. How much short sight can SMILE correct? SMILE is licensed to treat up to 10 dioptres of short sight and up to 5 dioptres of astigmatism. This allows almost all short-sighted people, except the most extremely short sighted, to be safely corrected with SMILE. For very short-sighted people, SMILE has been shown to be more predictable and stable than LASIK, meaning there is a lower chance of needing an enhancement to deal with over or under corrections. SMILE is also probably safer for very short-sighted people because it reduces the mechanical strength of the cornea less than LASIK does. SMILE is not currently licensed to treat long-sight, but this is undergoing clinical studies and will hopefully be available within the next 3 years. Which is better and safer - SMILE or LASIK? LASIK is still an excellent and safe procedure and has such great outcomes that a study to show whether SMILE or LASIK are better would need an impossibly large number of study patients (there are statistical reasons why this is so). Instead, the only practical way to answer this question is to do a non-inferiority study which needs less study patients. A large study of this type has been performed in Singapore which showed that, at the least, SMILE results are as good as the results for LASIK. 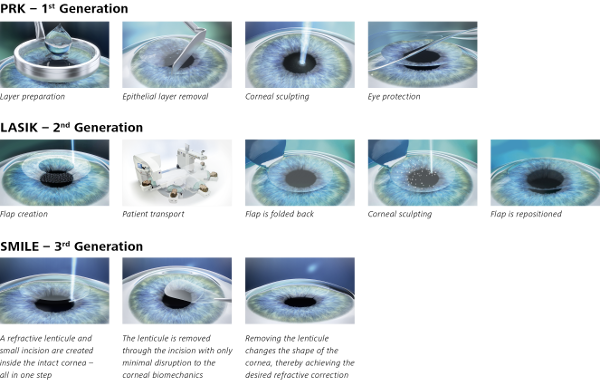 Both LASIK and SMILE are great procedures with large numbers of research studies showing their safety and effectiveness. For long sighted and presbyopic patients LASIK is still the procedure of choice, but I believe very strongly that if you are short sighted and younger than 40, SMILE is your best choice. There are number of very real advantages to SMILE which have been demonstrated in clinical studies on real patients. To be brief – because there is no corneal flap the eye is stronger and more resistant to injury than after LASIK. Clinical studies have shown that SMILE outcomes are more predictable and stable for larger corrections than with LASIK, and studies have also shown that there are less dry eye issues after SMILE than after LASIK. Why don't all laser clinics offer SMILE surgery? I am not sure why, but the main reason is likely to be the cost of the laser. If you would like to book a free consultation, contact us today. What happens during SMILE laser eye surgery article at Forbes. VisuMax Femtosecond laser vision correction technical information at Zeiss.